With all the planning that goes into your big day the one thing that you cannot plan for is the weather. Most can be dealt with but the thing that really plays havoc with most wedding days is a rainy wedding day. 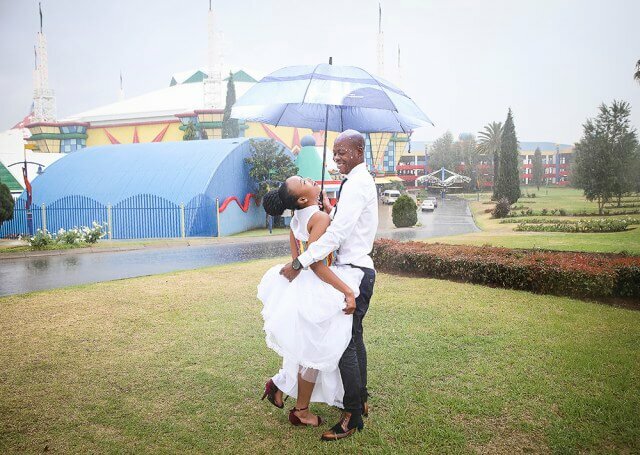 As we go into the summer rainy season in south africa i thought it would be good to share some ideas of what to do for rainy wedding day photos. Its an unpleasant thought to have that it might rain on your wedding day but its always a good idea to have a back up plan for your ceremony and reception if it does rain. Especially if your ceremony is inside. Most venues will suggest something along these lines but make sure to discuss it with them. When it comes to the photos if there is an indoor area that can be used in the case of rain as a last resort this is also a good idea. A pretty chapel or ceremony area can be used for the family and basic couple photos. If it does start to rain there are normally two types – a constant drizzle or a torrential downpour. The drizzle might stay around the entire day but the good news is with the use of umbrellas and rain covers on cameras. You can still get decent wedding photos as long as the couple is up for it. If its a torrential downpour this is not possible. However the other good news is that these don’t often last for very long . You might still have some time to do your family and couple photos outside. Your attitude if it rains is 100 percent a factor if it rains. You can still get great rainy wedding day photos if you are up for it but it may mean getting your hair, dress and shoes wet. So this would be your call. You would need to decide what is more important to you . But I would strongly suggest making the most of it because at the end of the day the photos are what lasts. The more fun you have the better. Sometimes you just have to go along with the fact that the rain is there and celebrate it. If you are worried about messing your outfit up you could consider bringing umbrellas and gumboots along with you. They are easy to incorporate into the photoshoot and you and your bridesmaids might be more comfortable jumping in puddles etc if you have gumboots. Then at least you can look back with fondness on those memories. Instead of remembering your wedding day photos as being cold and miserable and worried about getting wet.